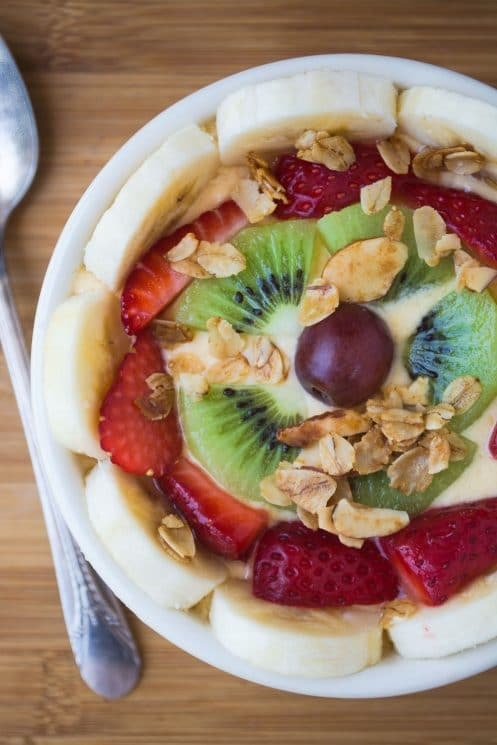 Smoothie bowls are all the rage for breakfast these days. They’re fun, colorful, and healthy, but sometimes they can be a little on the exotic side, with unusual ingredients like acai, goji berries, hemp seeds, and bee pollen. 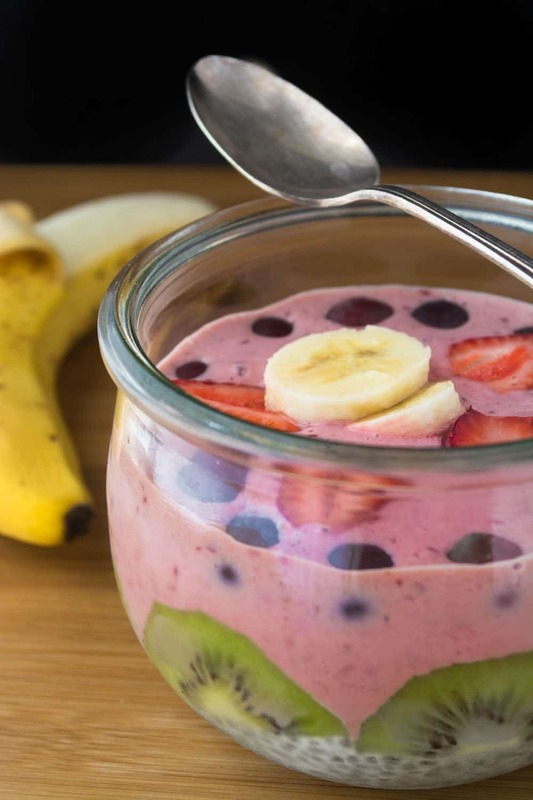 My kid-friendly breakfast bowls are made with recognizable ingredients to please even your most finicky little ones, without sacrificing any of the healthy benefits. I think they’re enticing enough to give sugary cereals a run for their money! There are lots of ways to ‘construct’ a breakfast smoothie bowl. In the above photos I started off with some chia pudding, made with almond milk and chia seeds, layered on the bottom. 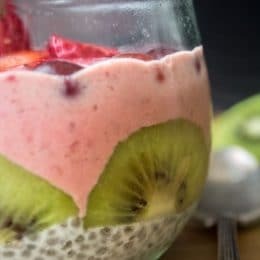 Because my bowl is clear, I arranged kiwi slices along the sides so they’d be visible, and then topped it off with a cherry smoothie, made thick and creamy with frozen cherries, Greek yogurt, and honey. The bowl above starts with a thick pineapple cantaloupe smoothie, topped with sliced banana, strawberry, kiwi, and a handful of crunchy granola. One of the keys to a smoothie bowl is to blend up your smoothie to a nice thick consistency so it can be eaten with a spoon. You can make your smoothie with a base of juice, almond or coconut milk, or yogurt. I use frozen fruit blended with Greek yogurt. Frozen fruit blends up into a super thick consistency — the more you use, the thicker your smoothie will be. It can even have a texture just like soft serve ice cream! I keep a freezer full of frozen fruit always. All I have to do is blend it up for a quick breakfast. To freeze fresh fruit, wash and peel it, if necessary. Keep berries and grapes whole, but cut larger fruit into bite sized pieces. Lay out the pieces on a parchment lined baking sheet. The paper keeps the juicy fruit from sticking to the pan as it freezes. Put the whole tray in the freezer and freeze until the fruit is frozen solid. Then you can store it in zip lock freezer bags for later use. Kids will be delighted when you whip them up a new, brightly colored breakfast every morning. 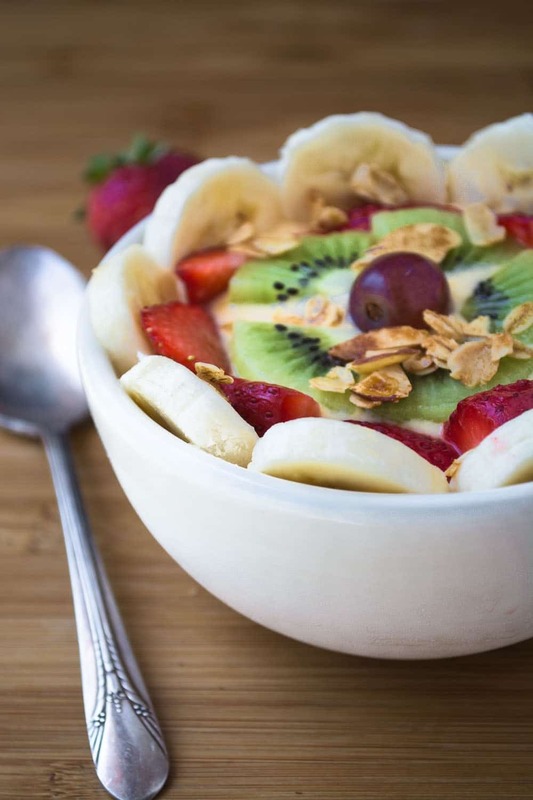 Smoothie bowls are delicious little works of edible art and it’s fun to arrange the bits of fruit on top. Get the kids involved in the process and they can design their own ‘masterpiece’. 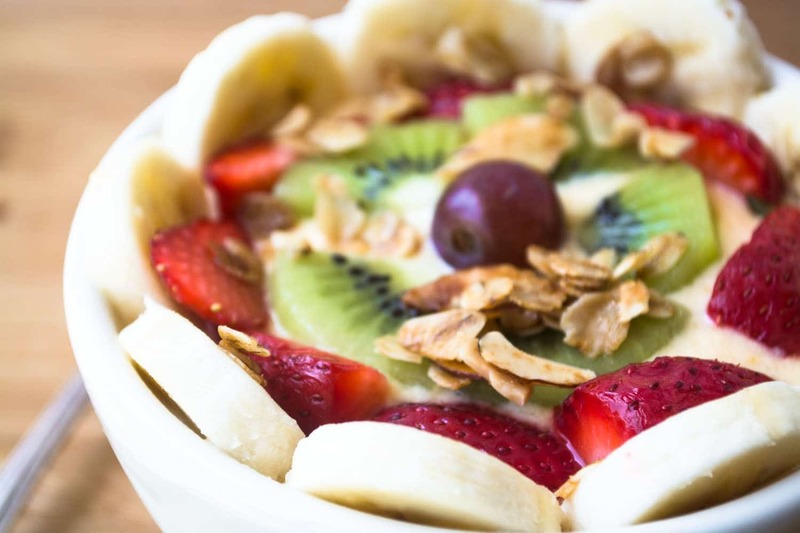 Besides fresh fruit, there are tons of other things you can use to decorate your smoothie bowl. Try shredded coconut, chopped nuts, pumpkin or sunflower seeds, dried fruit, and pomegranate arils, just to name a few. A sprinkle of granola adds a nice contrast of texture. You can find Sue over at The View from Great Island. Here you’ll find her busy cooking up all kinds of fun in her kitchen. Follow along with her on Facebook, too! 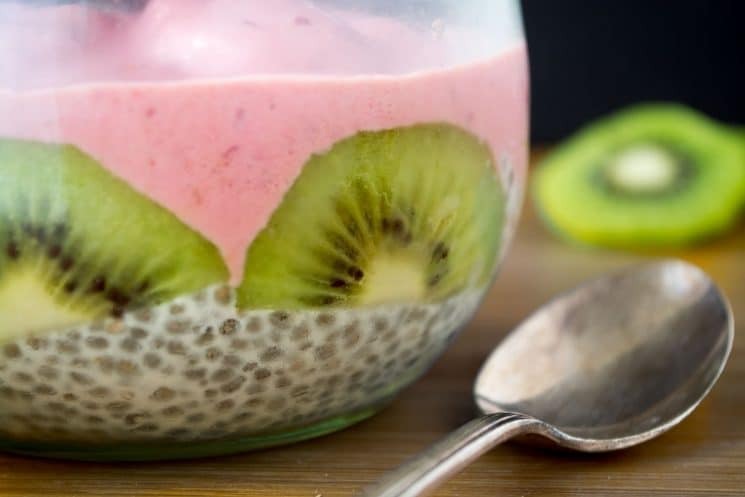 Spoon a layer of chia pudding on the bottom of a clear bowl. Arrange kiwi slices around the sides of the bowl. Blend the frozen cherries and the yogurt in a blender until smooth. Blend in the honey if using. 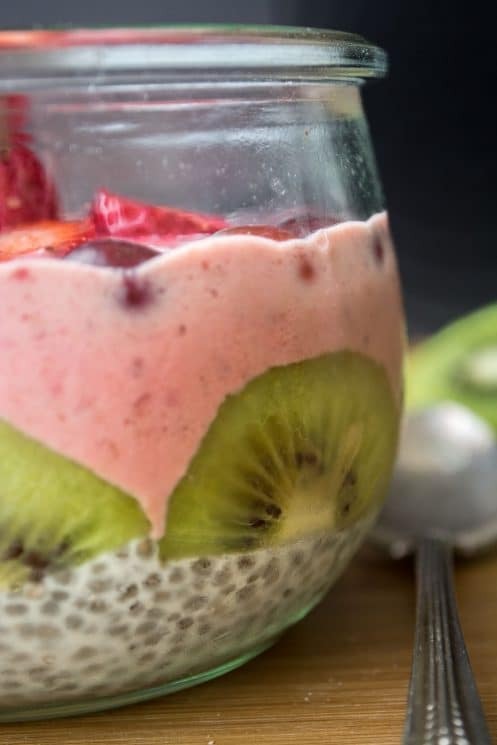 Add the cherry yogurt on top of the chia pudding. Blend the frozen fruit with the yogurt until smooth. Blend in the honey if using. Put the yogurt in a bowl and arrange banana slices around the outside. Arrange bits of fresh fruit across the top. Scatter granola over the surface. My kids would have been thrilled with these, what a fun and pretty way to start the day! What a creative, beautiful and well-balanced option for back to school breakfasts! Love this idea and the flexibility that goes with it. A party in a bowl is the perfect way to describe this recipe! 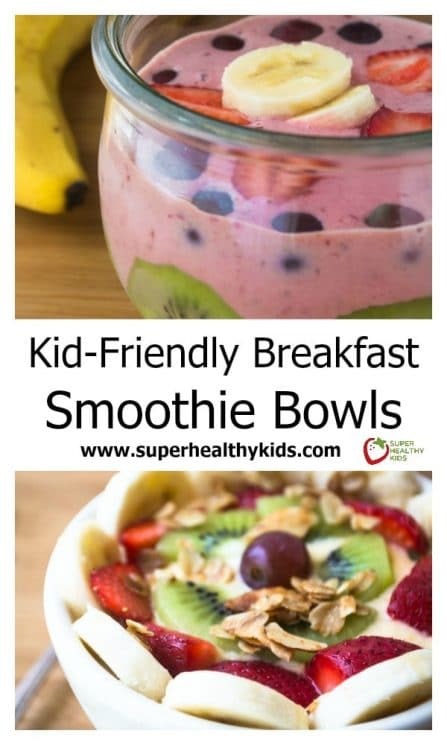 Any kid (or adult) I know would love this for breakfast!